Shakira Isabel Mebarak Ripoll (pronounced: ; born February 2, 1977), (English ) is a Colombian singer-songwriter, dancer, record producer, choreographer, and model. Born and raised in Barranquilla, she began performing in school, demonstrating Latin, Arabic, and rock and roll influences and belly dancing abilities. Shakira released her first studio albums, Magia and Peligro, in the early 1990s, failing to attain commercial success; however, she rose to prominence in Latin America with her major-label debut, Pies Descalzos (1996), and her fourth album, Dónde Están los Ladrones? (1998). Shakira has won many awards, including five MTV Video Music Awards, two Grammy Awards, eight Latin Grammy Awards, seven Billboard Music Awards, 28 Billboard Latin Music Awards and has been Golden Globe-nominated. She has a star on the Hollywood Walk of Fame, and she is one of the best-selling artists of all time, having sold more than 70 million records worldwide. Outside of her work in the music industry, Shakira is also involved in philanthropic activities through charity work and benefit concerts, notably her Pies Descalzos Foundation, her performance at the "Clinton Global Initiative" created by former U.S. President Bill Clinton, and her invitation to the Oval Office by President Barack Obama in February 2010 to discuss early childhood development. As of 2014, she is listed as the 58th most powerful woman in the world by Forbes. Shakira was born on February 2, 1977 in Barranquilla, Colombia. She is the only child of William Mebarak Chadid and Nidia Ripoll. Her paternal grandparents emigrated from Lebanon to New York City, where her father was born. From her mother, Nidia Ripoll, she has Spanish (Catalan and Castilian) and Italian ancestry. She has eight older half-siblings from her father's previous marriage. 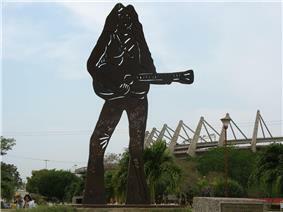 Shakira spent much of her youth in Barranquilla, a city located on the northern Caribbean coast of Colombia. Shakira wrote her first poem, titled "La Rosa De Cristal" ("The Crystal Rose") when she was only four years old. As she was growing up, she was fascinated watching her father writing stories on a typewriter, and asked for one as a Christmas gift. She got a typewriter at the age of seven and has continued writing poetry since then. These poems eventually evolved into songs. When Shakira was two years old, an older half-brother was killed in a motorcycle accident and at the age of eight, Shakira wrote her first song, titled "Tus gafas oscuras" ("Your dark glasses"), which was inspired by her father, who for years wore dark glasses to hide his grief. When Shakira was four, her father took her to a local Middle Eastern restaurant, where Shakira first heard the doumbek, a traditional drum used in Arabic music and which typically accompanied belly dancing. She started dancing on the table, and the experience made her realize that she wanted to be a performer. She enjoyed singing for schoolmates and teachers (and even the nuns) at her Catholic school, but in second grade was rejected for the school choir because her vibrato was too strong. The music teacher told her that she sounded "like a goat". At school, she says she had been known as "the belly dancer girl", as she would demonstrate every Friday at school a number she had learned. "That's how I discovered my passion for live performance," she says. To instill gratitude in Shakira for her upbringing, her father took her to a local park to see orphans who lived there. The images stayed with her and she said to herself "one day I'm going to help these kids when I become a famous artist." Shakira returned to recording music under Sony Music along with Columbia in 1995 with Luis F. Ochoa, using musical influences from a number of countries and an Alanis Morissette-oriented persona which affected two of her next albums. These recordings spawned her third studio album and major-label debut Pies Descalzos. Recording for the album began in February 1995, after the success of her single "¿Dónde Estás Corazón?". Sony gave Shakira $100,000 to produce the album since they predicted that the album would not sell past 100,000 copies. Starting with this album, Shakira began producing her own music, perfecting her vocals and most of all, practicing creative control over her music. Highly influenced by the American alternative market and British groups such as The Pretenders, the album's songs are melodic, musically surprising and gritty, with intellectual lyrics and an electronic/acoustic blend that effectively broke the formulaic mold of Latin pop with an authentic sound that had not been heard before. The album, Pies Descalzos, was released in February 1996. It debuted at number one in eight different countries. However, it only managed to reach number one-hundred-eighty on the U.S. Billboard Hot 100 but reached number five on the U.S. Billboard Top Latin Albums chart. The album spawned six hit singles, "Estoy Aquí" which reached number two on the U.S. Latin chart, "¿Dónde Estás Corazón?" which reached number five on the U.S. Latin chart, "Pies Descalzos, Sueños Blancos" which reached number 11 on the U.S. Latin chart, "Un Poco de Amor" which reached number six on the U.S. Latin chart, "Antología" which reached number 15 on the U.S. Latin Pop Songs chart and "Se quiere, Se Mata" which reached number eight on the U.S. Latin chart. In August 1996, RIAA certified the album platinum status. Her fourth studio album, Dónde Están los Ladrones?, produced entirely by Shakira herself and Emilio Estefan, Jr. as the executive producer, was released in September 1998. The album, inspired by an incident in an airport in which a suitcase full of her written lyrics was stolen, became a bigger hit than Pies Descalzos. The album has reached a peak position of number 131 on the U.S. Billboard 200 and held the top spot on the U.S. Latin Albums chart for 11 weeks. It has since sold over seven million copies worldwide and 1.5 million copies in the U.S. alone, making it one of the best selling Spanish albums in the U.S. Eight singles were taken from the album including "Ciega, Sordomuda", "Moscas En La Casa", "No Creo" which became her first single to chart on the U.S. Billboard Hot 100, "Inevitable", "Tú", "Si Te Vas", "Octavo día", and the "Ojos Así". The latter two songs won Shakira one Latin Grammy each with six of the eight singles reaching the top 40 on the U.S. Latin chart. 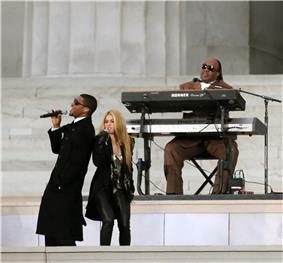 In May, Shakira collaborated with the South African group Freshlyground to create the official song of the 2010 FIFA World Cup in South Africa. "Waka Waka (This Time for Africa)", which is based on a traditional Cameroonian soldiers' Fang song named "Zangalewa" by the group Zangalewa or Golden Sounds. The single later reached the top 20 in Europe, South America and Africa and the top 40 in the U.S. and was performed by Shakira at the World Cup kick-off and closing. It became the biggest-selling World Cup song of all time. In October 2010, Shakira released her ninth studio album, Sale el Sol. The album debuted at number-seven on Billboard 200 in its first week, and at the top spot on the Billboard Top Latin Albums. The lead single "Loca" was number one in many countries. The album had sold over 1 million copies worldwide in 6 weeks, and over 4 million since its release. In September, Shakira embarked on The Sun Comes Out World Tour, in support of her two most recent albums. The tour visited countries in North America, Europe, South America, Asia, and Africa with 107 shows in total. The tour was met with positive reactions from critics, who praised Shakira's stage presence and energy during her performances. On November 9, 2011, Shakira was honored as Latin Recording Academy Person of the Year and performed a cover of Joe Arroyo's song "En Barranquilla Me Quedo" at the Mandalay Bay Events Center as a tribute to the singer who died earlier that year. In 2010 Shakira collaborated with rapper Pitbull for the song "Get It Started" which is the lead single from Pitbull's upcoming album Global Warming. The single was released on June 28, 2012. She was also signed to Roc Nation under management purposes for her upcoming studio album. In November 2011 Shakira said about her tenth album: "I already started to write new material. I've begun to explore in the recording studio whenever I have time in Barcelona and here in Miami. I'm working with different producers and DJs, and I try to feed off from that and find new sources of inspiration and new musical motivation. I'm anxious to return to the studio. My body is asking for it". She worked with producers such as Benny Blanco, Tïesto, RedOne, Max Martin, Dr. Luke, LMFAO, Akon, Fernando Garibay, Sia, Ester Dean, Skrillex, The Runners, Terius "The-Dream" Nash, Tricky Stewart, Shea Taylor and Billboard. Originally, the first single from her new album was expected to be a song named "Truth or Dare". The music video was filmed in Lisbon on June 29, 2012. But due to her unexpected pregnancy, plans to release the single and video were postponed. In August 2014, Shakira revealed that she was pregnant with her and Pique's second child. On September 17, 2012, it was announced that Shakira and Usher would replace Christina Aguilera and CeeLo Green for season four alongside Adam Levine and Blake Shelton. Shakira announced that she would focus on her new album in the fall and returned for the season six in February 2014. On September 1, 2013, Shakira gave an update on her album, stating: "Amazing day in the studio! 2 years and I finally feel in these songs as comfortable as [I do] in my torn jeans!". Shakira's self-titled tenth studio album was released March 25, 2014. On July 13, 2014, Shakira performed "La La La (Brazil 2014)" with Brazilian musician Carlinhos Brown at the closing ceremony of 2014 FIFA World Cup at the Maracanã Stadium. It made her third consecutive appearance at the FIFA World Cup. "Devoción" is a Spanish Rock song written by Shakira, Jorge Drexler, John Hill, Sam Endicott and Gustavo Cerati with musical composition. Shakira is influenced by Arabic music and is one of the first singers to combine Arabic music with Rock and Roll. 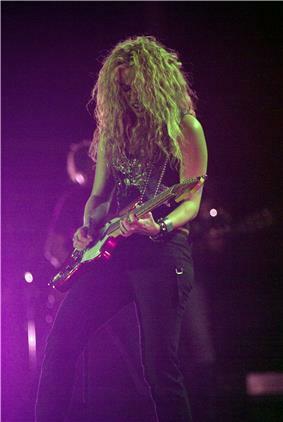 Shakira made several covers of prominent artists such AC/DC and Aerosmith, using them to sing in her tours, resulting in performances of "Back in Black" and "Dude (Looks Like a Lady)" during her Tour of the Mongoose. She also sang the classic Elvis Presley song "Always on My Mind" at the VH1 Divas Live. In her 2010–2011 tour called The Sun Comes Out World Tour, she sings "Nothing Else Matters" by the heavy metal band Metallica in an oriental style. She is also strongly influenced by Andean music and South American folk music, using her native instrumentation for the Latin dance-pop "Whenever, Wherever" and "Despedida". Shakira recently performed two songs for two separate Haiti benefit events: "I'll Stand By You", by The Pretenders, and "Sólo le pido a Dios" by León Gieco. According to Sony, Shakira is the highest-selling Colombian artist of all time, having sold between 50 and 60 million albums. According to Nielsen Broadcast Data Systems, "Hips Don't Lie" was the most-played pop song in a single week in American radio history. It was played 9,637 times in one week. Shakira became the first artist in the history of the Billboard charts to earn the coveted number one spots on both the Top 40 Mainstream and Latin Chart in the same week doing so with "Hips Don't Lie". Her song "La Tortura" broke the record on the Billboard's Hot Latin Tracks chart, appearing at number-one more than any other single with a total of 25 non-consecutive weeks. In 2011, Shakira was honored at the Latin Grammys as 2011's Latin Recording Academy Person of the Year. She also received a star on the Hollywood Walk of Fame located at 6270 Hollywood Blvd. Originally, she was to be given a star on the Hollywood Walk of Fame in 2004, but she turned the offer down. In 2012, she received the honor of Chevalier De L’Ordre des Arts et des Lettres. Shakira is the first musical act to perform third time at the FIFA World Cup. A bottle of S by Shakira, the first women's fragrance by Shakira. ^ "Rolling Stone". Rolling Stone. Retrieved September 28, 2014. ^ Diego, Ximena (2002). Shakira: Woman Full of Grace. The Rosen Publishing Group. pp. 19–20. ^ Williams, Zella (2010). Shakira: Star Singer/Estrella de La Cancin. Simon & Schuster. p. 6. ^ Day, Holly (2007). Shakira. Lucent Books. p. 15. ^ Krohn, Katherine (2007). Biography Shakira. Lerner Publishing Group, Inc. p. 11. ^ "'"Shakira: 'I don't hate Britney. News.bbc.co.uk. Retrieved September 28, 2014. ^ "RIAA: Gold & Platinum. Search results for Pies Descalzos". ^ "Shakira — MTV Unplugged: Review". Allmusic. ^ "Emilio Estefan Tops Latin Grammy Noms List". ^ Valdes-Rodriguez, Alisa (April 18, 1999). "Queen of Crossover?". Los Angeles Times. Retrieved April 18, 1999. ^ "Search results for Shakira". ^ "Shakira Wins Big At Latin Grammys — CBS News". ^ "'"New Music: Shakira – 'She Wolf. Rap-Up.com. Retrieved October 31, 2009. ^ "'"Q4 Label Special: RCA's Tom Corson and Peter Edge on Miley, Britney & JT, the Adult Xmas Market, 'Focusing on Hip-Hop & Rock. Billboard. 2013-10-22. Retrieved 2014-03-24. ^ """Shakira - "When the time came to put a name to this album…. ^ a b Cobo, Leila (November 10, 2001). Billboard 113 (45). ^ a b Ma, Suzanne. "Cover Story: Shakira - A Cultural Fusion". ^ Petridis, Alexis (March 8, 2002). "Thong songs". ^ Ditzian, Eric (2009-07-21). "'"Shakira Says New Album She Wolf Is 'Very Electronic. MTV.com. Retrieved 2014-03-24. ^ "'"Shakira plans November release for 'Sale El Sol. The Independent (London). August 23, 2010. ^ "Mini Biography – Shakira" (PDF). Dailynews. Archived from the original on May 10, 2012. Retrieved June 8, 2002. ^ "Shakira Most Downloaded Latin Artist". Themusicmagazine. May 3, 2010. Archived from the original on March 12, 2012. Retrieved May 3, 2010. ^ "Year-End: Online Video's Most Viral Artists of 2010". Billboard. December 10, 2010. Retrieved February 28, 2011. ^ ""El Oasis"". IMDb. Retrieved September 28, 2014. ^ "'"First Look at Shakira's Cameo in 'Ugly Betty. Celebrity-mania.com. November 28, 2009. Retrieved March 5, 2010. ^ "'"Selena Gomez On Shakira's 'Wizards Of Waverly Place' Cameo: 'I Was Starstruck The Entire Time. Hollywoodcrush.mtv.com. February 16, 2010. Retrieved March 5, 2010. ^ "Shakira Rests Hips to Study at UCLA". ^ "Shakira'sIQ of 140 makes the colombian singer A 'Genius', Mensa International Reports.". Huffington Post. Huffington Post. 6 May 2013. Retrieved 25 March 2014. ^ "'"Shakira publica una foto con Gerard Piqué en Facebook y Twitter: 'Les presento a mi sol. ^ "Shakira Expecting First Child". ^ "Shakira Pregnant With Second Child". ^ "Free Your Mind: Shakira". ^ "White House Initiative on Educational Excellence for Hispanics to Convene President's Advisory Commission Members". In March 2010, she was awarded a medal by the UN  In November 2010, after performing as the opening act of the MTV European Music Awards, the Colombian singer also received the MTV Free Your Mind award for her continuing dedication to improve access to education for all children around the world. In February 2011, the FC Barcelona Foundation and Pies descalzos reached an agreement for children's education through sport. On October 5, 2011, US President Barack Obama announced that Shakira was appointed as a member of the White House Initiative on Educational Excellence for Hispanics. Shakira was honored at the Latin Grammys as the Latin Recording Academy Person of the Year on November 9, 2011, for her philanthropy and contributions to Latin Music. Shakira, Alejandro Sanz and Juan Carlos I, The King of Spain during the IberoAmerican Summit of El Salvador. On April 3, 2006, Shakira was honored at a UN ceremony for creating the Pies Descalzos Foundation. At the event, Shakira said, "Let's not forget that at the end of this day when we all go home, 960 children will have died in Latin America." On September 28, 2007, at the Clinton Global Initiative, it was revealed that Shakira received a commitment of $40 million from the Spanish government to help the victims of natural disasters. An additional $5 million was to be donated to four Latin American countries, to be spent on education and health. As part of the May 2007 concerts, her ALAS Foundation was able to solicit commitments of US$ 200 million from philanthropists Carlos Slim, Mexico's richest man, and Howard Buffett, son of U.S. investment guru Warren Buffett, Shakira announced on April 15, 2008. 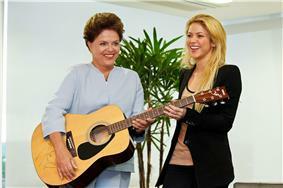 Brazil's president Dilma Rousseff receiving a guitar for Shakira's charity auction (2011). Shakira is currently in a relationship with the Spanish football player Gerard Piqué, centre back for FC Barcelona and the Spanish national team. They met in spring 2010 when Piqué appeared in the music video for Shakira's song "Waka Waka (This Time for Africa)", the official song of the 2010 FIFA World Cup. Shakira officially confirmed their relationship on March 29, 2011 via Twitter and Facebook, posting a picture of the two with a caption reading, "I present to you my sunshine." It was the first time she had ever spoken of the relationship after several months of media speculation. In September 2012, Shakira confirmed that she and Piqué were expecting their first child together. Shakira gave birth to the couple's son, Milan Piqué Mebarak, on January 22, 2013 in Barcelona, Spain, where the family resides. The couple are now expecting their second child together. 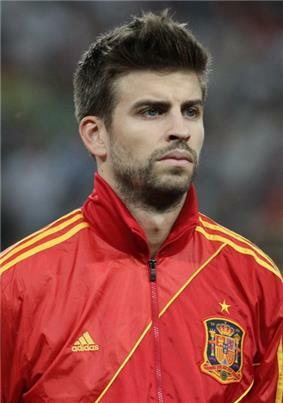 Spanish football player Gerard Piqué started a relationship with Shakira in 2010. Shakira is a native Spanish speaker who speaks fluent English and Portuguese, as well as some Italian, French, Catalan and Arabic. Shakira is a Roman Catholic, and met Pope John Paul II in 1998. She is interested in world history, and she frequently studies the history and languages of the countries she visits. After her Oral Fixation tour ended in the summer of 2007, Shakira attended a summer school class in Los Angeles at UCLA Extensions, where she took courses in History of Western Civilization. She used her middle names, Isabel Mebarak, and told the professor she was visiting from Colombia so as to avoid being recognized as a celebrity. Shakira is also reputed to have an IQ of 140. Shakira is a cousin of model, and 2005–2006 Miss Colombia, Valerie Domínguez. In an interview on The Paul O'Grady Show, she referred to herself as a mutt due to her diverse ancestry, which she noted as a theme behind her song "Gypsy". Shakira began her own beauty line, "S by Shakira", with parent company Puig, in 2010. 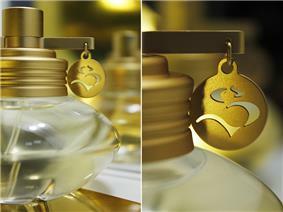 The brand has released two perfumes, "S by Shakira" and "S by Shakira Eau Florale," along with lotions and body sprays. She made her first terminal tattoo, which she dedicated to Pique, to promote a healthy way of making tattoos. At a release event for the first fragrance, Shakira stated: "The type of women who feel a connection with this fragrance would be independent and strong, but also a woman with a great capacity to love and a strong sense of who they are. It's for a woman who believes in herself." In 2012, she released a new fragrance "Elixir by Shakira".